Uncle John is an audacious combination of genres: a slow-burning mystery-thriller mixed with a mumblecore love story. There’s a dash of morbid comedy thrown in for good measure, too. First-time feature director Steven Piet offers audiences two wildly divergent storylines that can nearly stand on their own accords, but he—somehow—deftly joins the disparate elements together, using contrasts to his advantage. The film opens with a voice, sermonizing and quoting Bible passages as the camera pans along the open roads of Wisconsin’s pristine countryside. It’s an unsettling and eerie start, with the slightly distorted voiceover—reminiscent of a cult leader preaching to his flock—set against cinematographer Mike Bove’s golden-hued shots of rolling farmland. Later, we assume the voice belongs to Dutch, the town’s bad boy who ultimately found Jesus. Dutch has been reaching out to the people he’s hurt, repenting and making amends for the mistakes in his life. One of these sessions doesn’t go well—the titular John (John Ashton) is first introduced as he covers up Dutch’s murder. The local farmer/carpenter has a sterling reputation around town, so when Dutch is reported missing, no one suspects John’s involved with the disappearance—with the exception of Dutch’s younger brother Danny (Ronnie Gene Blevins). While John spends much of the film trying to hide his sins, especially from his gray-haired, potbellied coffee klatch, he’s not your typical cinematic killer. 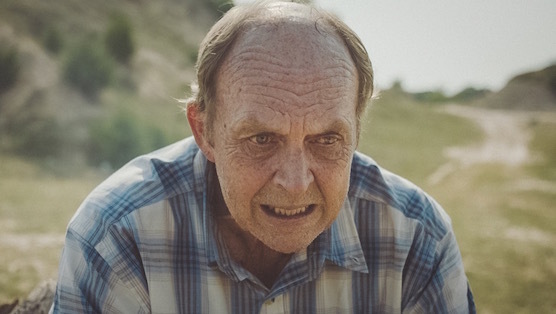 Longtime character actor Ashton (Gone Baby Gone, Beverly Hills Cop) turns in a magnificent performance as the buttoned-up farmer whose secrets weigh heavily on his conscience. He’s remorseful, but not enough to turn himself in to authorities. Uncle John then inexplicably shifts its action to a commercial video production house in Chicago and an office full of millennials. Yes, it’s confusing and head-spinning—our first reaction is “What’s going on here?”—but Piet and co-writer Erik Crary use this switch to deepen the mystery. The film follows computer graphics designer and John’s nephew, Ben (Alex Moffat), and his crush on the company’s new director Kate (Jenna Lyng), a recent transplant from New York. The scenes in Chicago focus on their dynamic as it moves from a work relationship to friendship to possibly something more. These scenes—replete with the copious amounts of beer consumed—is reminiscent of the courtship dance between Jake Johnson and Olivia Wilde in Joe Swanberg’s Drinking Buddies (2013). Lyng and Moffat have a decent onscreen chemistry as characters trying awkwardly to navigate the dating pool. While the plotlines are poles apart, Piet manages to keep the aesthetics similar in both settings. The script isn’t heavy on dialogue, and Ben is as reserved as his uncle who raised him, leading us to wonder if he also has secrets simmering beneath the surface. The film’s pacing also remains steady throughout; instead of the “big city” feel of skyscrapers, rushed traffic and noise, the scenes between Ben and Kate are relegated to the stark office, a neighborhood bar and quiet streets at night, as they’re both working long hours on the same project. It’s a wise decision—a busy Chicago would make it even harder for viewers to reconcile the two narratives. The contrasts between city and country stories lie in the characters and their conversations. Ben and Kate discuss work, coffee and their exes, while John and the small town are consumed with gossip about Dutch’s disappearance. Piet takes too long to merge the John and Ben-Kate scenes, but the transition, when it does happen, is seamless. The last third of the film has a surprising number of moments of breath-holding suspense. John finds it’s getting hard to keep his secret, especially when Dutch’s brother Danny comes sniffing around during an impromptu family reunion between John and Ben, with Kate along for a road trip. Danny toys with John, pushing his buttons, hinting at the secret that might have led John to kill. There could have been a more thorough exploration of John’s history with Dutch and his emotional headspace, but instead Crary and Piet give us the bare minimum to piece it together. To compensate, the action is ratcheted up through the use of intercuts that volley confrontations between Danny and John, and Ben and Kate. Piet keeps the audience guessing, unsure of the resolution for either story. There’s a subtle use of comedy amid the suspense. John seems to get visitors at the most inopportune moments. When he creates a makeshift funeral pyre for Dutch at a quarry, a neighbor asks if he can help, and offers him fresh coffee and turnovers while the body burns nearby. Another neighbor openly flirts with John, offering him pie as he does some cabinetry work in her kitchen. He’s concerned with other matters, but in seeing her disappointment with his indifference asks for a rain check. These scenes are sad and droll, Ashton’s face signaling mixed emotions. But because the humor is sparse, it’s often a distraction. Ultimately, Uncle John studies the disparity between small-town and city life and between generations of a family, couched within the framework of a thriller and romance. To reconcile such opposing genres and storylines is a huge risk for any filmmaker, let alone a first-time helmer like Piet. And while Uncle John isn’t perfect, Piet’s adventuresome debut leaves us excited to see what genre(s) he takes on in his next effort.